Cahir Development in association with Cahir Tidy Towns and Promoting Cahir embark on the 2nd phase of the Christmas Light Project for the town and they will be spending a further €7000 this year. This money will come from the proceeds of our community lotto and the €1000 won at the Bank of Ireland awards. 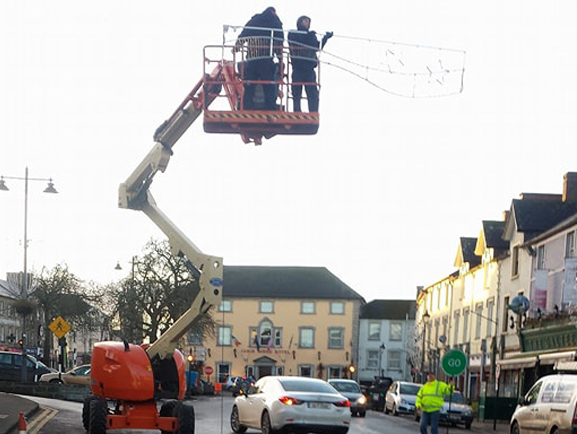 At the moment you will see Stephen Flannery and his team putting up the lights with the help of Ger Cashman, Francis Murray and Cahir Tidy Towns on traffic management. CDA are very grateful also for the help from John O' Meara County Council who has erected temporary poles on the left side of the bridge so that we can put up new lights this year. We are also indebted to the council for giving us very safe storage for the Christmas lights when they come down. Thanks to Burkes Ironworks who is always given last minute work to do and never fails to supply. They are once again very grateful to their two major sponsors, Cahir Credit Union and the Tipperary County Council who along with Cahir Community Lotto and Cahir Community Bingo have made it possible for them to have such festive lights in our town. Without their initial sponsorship this whole project would not have been possible. The cost of erecting the lights falls on the traders each year. Without their continuous generosity year on year this project would not be possible for the town. They appreciate your continuous support over the years and would like to take this opportunity to wish you and your business a happy and successful Christmas.